Kit preview of Yellow Submarine's Assault Suits Valken 2 Model Kits. It seems as if most of the cooler-looking mech designs ("cooler", if you go for the hulking, utilitarian aesthetic) are coming from game licenses. 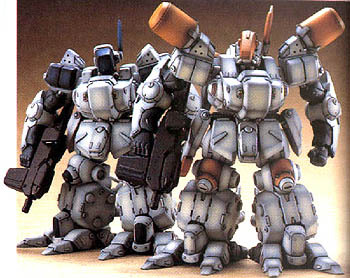 Examples include the games Assault Suits Leynos (Leinos)/Valken and their sequels, as well as the Heavy Gear universe, Front Mission 2, and Armored Core. 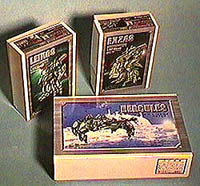 The Leynos/Valken games started in the late eighties. Their sequels in the 90's spawned a series of resin kits from Japanese Hobby Shop/Manufacturer, Yellow Submarine. 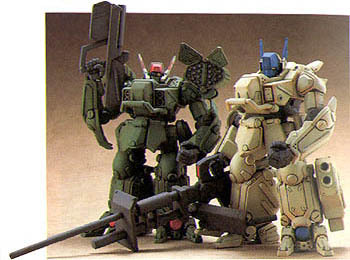 This kit line, all in 1/72nd scale, includes several good and bad guy mechs, as well as a couple of legged armor vehicles. 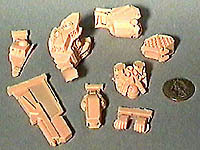 All the Assault Suits Valken 2 kits (or at least the three I've seen) are made from a peach colored, rather pungent resin. Each kit comes in a sturdy little box with color wrap-around covers. They were well packed, with bubble wrap padding and the smaller parts stuck in separate baggies. This is important. These kits may only stand about 5"-6" tall when done, but there are lots of parts! There are no decals, though none are really needed. The box covers show colored line drawings of the vehicles. This is your only painting guide, though you can come up with some cool (and better-looking) schemes if you just blaze your own creative trail. Each comes with a small, black and white, cleanly executed instruction sheet. It's divided into two sections: an illustrated parts checklist and an exploded view. The latter is your construction guide. The parts are shown in relative positions, but there are no arrows or detail drawings showing exactly where and how the parts fit together. Because of this, I'd only recommend these kits for advanced modelers. Okay - on to the real meat: the parts. Where it really matters, these kits come through with flying colors. The parts are crisply molded, with virtually no flash. There are no signs of pinholes or mold irregularities. These are resin kits done right! The average parts count for each kit is around sixty! This includes a few variant pieces on each (see below for details). There are no moveable joints. Best as I can tell, the choice of pose is "limited" to "nil". The kits poses tend to be "at ease". 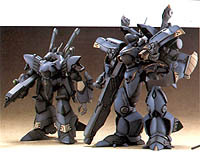 Most of the mechs in the Valken line come in two variations: a Commander and Production Type. The Commander models tend to be a little larger, more heavily armed, or otherwise cooler. 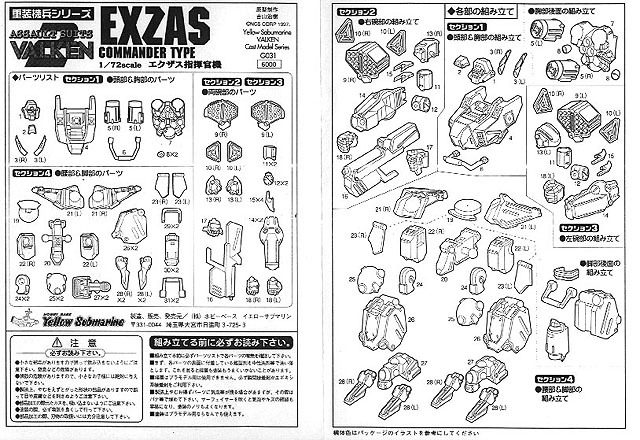 Such is the case with the Exzas - the Commander model is shown above, standing on the left, next to the Production model. 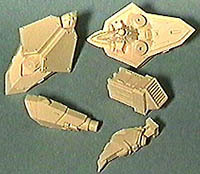 The most noticeable difference between the two models are the Commander's shoulder-mounted missile pods. These are intricately beautiful resin pieces. The missile pod doors can apparently be modeled open or closed. Aside from that, the only other option is the right hand. You can apply a clenched fist, or a hand that holds a nasty looking rifle. Overall this is just a beautiful design (the same way an A-10 is beautiful...). The front view, pictured above, only hints at the overall detail. The detail on the backpack is nicely molded, with conduits, vernier rockets, and some kind of techie-looking cylinders. This design is certainly the most reminiscent of Heavy Gear designs, due to the large shoulder pods looking like a Gear's V-Engine cylinders. Like all the other kits in the line, the detail is fine and crisp. Unlike the other two kits reviewed here, the Leinos has no optional parts. Still, the basic kit is very nice. ^ The box tops of the three kits. These provide the only painting guide for these kits, though the creative freedom will be welcome to many. ^ A look at some of the Exzas parts, with a US quarter next to them for scale comparison. This picture doesn't really translate the level of well molded detail in the kit. ^ The Leinos' parts, similarly laid out. Again, the quality is top notch. ^ The underside of the Hercules exhibits a different character, with a rather large exhaust system running the length. ^ A selection of detail parts from the Hercules, including leg components and one of the rear-mounted missile batteries. ^ Just to give you a bit of perspective on the line's design, here's a picture of two of the cooler "bad guy" mechs. 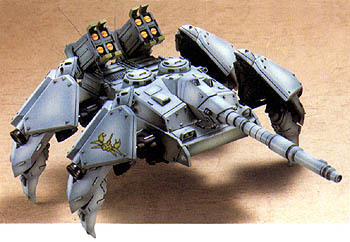 The Valken line features two tanks: the Hercules and the Scorpion. The Hercules is certainly the most anachronistic. The design of its main body obviously carries echoes of the German WW2 StuG III Assault Gun. But I'm not saying that's a bad thing! I'm a StuG fan. The tanks come in larger boxes and demand a higher pricetag (9800 yen, or about $85 USD), but they aren't appreciably larger kits. The main body of the Hercules is about 4" long. It's a tad pricey, but it's a fine kit... and I'm such a sucker for StuGs! Again - no air bubbles, crisp detail, and almost no flash. There doesn't appear to be any posability. The kit supplies an option of gun barrels. One harkens back to the real StuG, with a big ole flash suppressor on the end. The other barrel is more modern, featuring what appears to be a bore evacuator halfway down the length of the barrel. Those missile launchers perched on the back of the vehicle are just too cool! Overall, the kit is composed of 54 pieces. These models are not available domestically. The only source for them is direct from Japan, using a dealer like Rainbow Ten or Hobby Link Japan. I'm not sure how much longer the line will be supported. These kits were made in '97, so they're not really new. Still, I hope they're around for a while, as the designs are a nice departure from the "giant humanoid robot/battlesuit" mainstream, typified by Gundam or Evangelion. So - what are my thoughts in a nutshell? These are really great little kits - some of the best resin work I've seen. 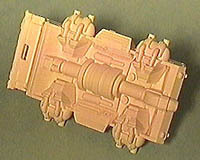 Coupling that with the cool designs makes this kit line the cat's banana... or top cheese... or, well - you get the idea. They're good! Averaging 5000-6000 Yen (about $45-$55 USD) each, these models are reasonably priced for what you get (relative to other resin kit pricing). I plan on picking up a few more in the series as soon as my wallet stops whining about being hungry again. Build up photos from Hobby Japan EX, Summer '98. This page copyright © 1999 Starship Modeler. Last updated on 12 August 1999.